Investing in innovative prevention programs that provide measurable benefits to Florida's children, families and communities. Helping families and communities so children can grow and develop through healthy, safe and nurturing experiences. Strengthening families by helping parents to overcome significant challenges that place their children at increased risk of abuse and neglect. Founded in 1989, The Ounce of Prevention Fund of Florida is a private, nonprofit corporation dedicated to shaping prevention policy and investing in innovative prevention programs that provide measurable benefits to our state's children, families and communities. The Ounce of Prevention Fund of Florida identifies, funds, supports and tests innovative programs to improve the life outcomes of children, preserve and strengthen families and promote healthy behavior and functioning in society, recognizing that the wisest money spent is on prevention. The Ounce of Prevention Fund of Florida is one of 50 state chapters of Prevent Child Abuse America (PCA America). The chapter implements primary prevention activities and advocates for policies and initiatives to strengthen Florida's families and communities so children can grow and develop through healthy, safe and nurturing experiences. Healthy Families Florida is a nationally accredited home visiting program for expectant parents and parents of newborns experiencing stressful life situations. The program improves childhood outcomes and increases family self-sufficiency by empowering parents through education and community support. 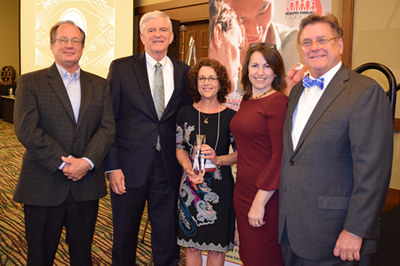 Congressman Daniel Webster presented Carol McNally with the 2018 Daniel Webster Leadership Award during the Healthy Families Florida Annual Leadership Meeting in Orlando. This annual award recognizes individuals for their outstanding leadership and unwavering commitment to the prevention of child abuse and neglect. First Lady Ann Scott hosted a group of students, child advocates, and local and state leaders to kick off the statewide Pinwheels for Prevention campaign in observance of Child Abuse Prevention Month. 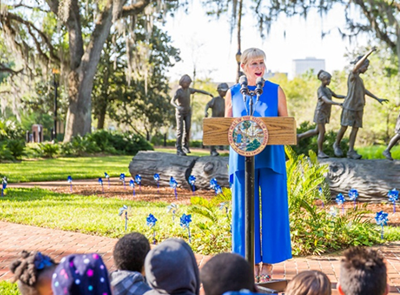 First Lady Scott, Prevent Child Abuse Florida and guests planted a pinwheel garden on the Governor’s Mansion lawn in support of the annual awareness campaign. If you suspect a child is being abused or neglected in Florida, the law requires you to report it to the Florida Abuse Hotline at 1-800-96-ABUSE (1-800-962-2873). For more information on reporting child abuse and neglect, please read Report Abuse, It's the Law.